Imagine the public outcry if the Ontario government ignored mercury poisoning in the Grand River watershed in southwestern Ontario. The public pressure to clean it up immediately would be overwhelming. The government would rigorously explore every option to clean it up. Yet, the sad truth is that for over 30 years the Ontario government has ignored scientific reports on the need for and ways to clean up the mercury poisoning in the English-Wabigoon River System in northwestern Ontario. The Grassy Narrows First Nation has paid the price with losses to their health, economy and culture. Imagine the public outcry if the Ontario government ignored mercury poisoning in the Grand River watershed in southwestern Ontario. The public pressure to clean it up immediately would be overwhelming. The government would rigorously explore every option to clean it up. 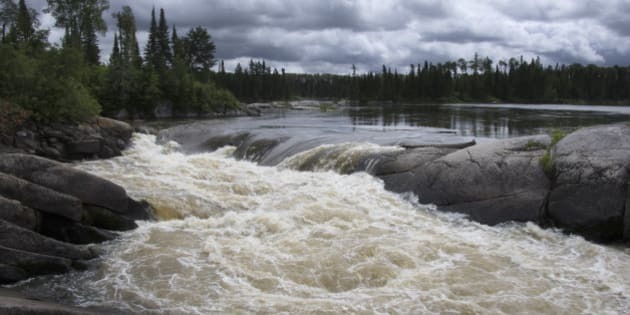 Yet, the sad truth is that for over 30 years the Ontario government has ignored scientific reports on the need for and ways to clean up the mercury poisoning in the English-Wabigoon River System in northwestern Ontario. The Grassy Narrows First Nation has paid the price with losses to their health, economy and culture. It's been far too easy for successive Ontario governments to ignore the crisis in Grassy Narrows. This has to stop, and it has to stop now. The province has a moral obligation to clean up the mercury. We all need to keep up the pressure to get the Liberal government to act. This tragic story started in the 1960s when the Dryden pulp and paper mill dumped 10 tonnes of mercury into the English-Wabigoon River system. The poison spread throughout the river system with tragic consequences for the people of Grassy Narrows and the nearby Wabaseemoong (Whitedog) First Nation. The mercury entered the food chain and accumulated in the fish that were a major part of the local diet. This caused severe mercury poisoning with symptoms including neurological problems and birth defects. The mercury poisoning has also hurt the local economy forcing the closure of the commercial fishing industry and a local fishing lodge, which has lead to high unemployment. The people of Grassy Narrows live with the human health and economic fall out to this day. According to a recent Toronto Star investigation, Ontario's Minister of the Environment recommended a mercury cleanup plan to cabinet in 1984. But it appears that cabinet killed the $2-3 million remediation plan, acting against the best advice of an expert panel of scientists hired by the federal and provincial governments. It's shameful that the government waited another three decades to conduct another study on clean up options for the English-Wabigoon River system. It's downright negligent to learn that the current Liberal government failed to act on reports from a former mill employee raising concerns about an illegal mercury dump site in the area, until a Toronto Starreport made it public. The foot dragging on cleaning up Grassy Narrows has to stop. Meanwhile, three generations of Grassy Narrows people continue to be diagnosed with symptoms of mercury poisoning. Many of these folks traveled hours to Queen's Park for a rally on June 2 after the release of another government funded report showing how the mercury can be cleaned. The premier responded with concern and expressed a desire to clean up the river system. But she also cautioned that the clean up might make things worse because of the risks posed by large scale dredging. However, neither the 1984 remediation plan nor the plan released in May of this year proposes large scale dredging or activities that would disturb the sediment. Instead, the scientists propose a remediation method called "clean clay suspension." The clean clay would not disturb the mercury contaminated sediment. It would bury it, bind it and thus remove it from the food chain. According to the Toronto Star, the government could not provide "any scientific evidence cautioning against these methods." The foot dragging on cleaning up Grassy Narrows has to stop. We owe it to the people of Grassy Narrows and Wabaseemoong First Nations to end this human tragedy. No more excuses, no more delays. Otherwise, the Liberal government's pledged actions on the recommendations of the Truth and Reconciliation report will ring hollow, and the visit to Grassy Narrows last week by Environment Minister Glen Murray and Indigenous Relations and Reconciliation Minister David Zimmer will simply be a PR move. Real reconciliation begins with actions. I encourage everyone to take a small action by writing your MPP and the premier calling for the cleanup of the mercury poisoning in Grassy Narrows. It shouldn't take rallies, demonstrations, and letter writing campaigns to push the government to do the right thing. But it has. And it will.